The real question is, who ISN'T making wedding dresses? Lots of mass-market, retail clothing companies seem to be getting in on the act, with simple styles that would be perfect for destination and informal weddings. The good news for you is that most of the dresses are more affordable than anything you'd find in a boutique. In fact, many of these new offerings are so inexpensive (as wedding dresses go) that some brides are using them as "reception dreses"- dresses they change into after the ceremony so they can dance all night at the reception. But how do the dresses look? Let's see. Can Old Navy be far behind??? On the other hand, are you having a formal or semi-formal traditional wedding with all the bells and whistles? We've got you covered, too! Later this week, we'll look at some of the benefits of getting your dress online. And later this month, we'll take a closer look at the concept of "reception dresses". 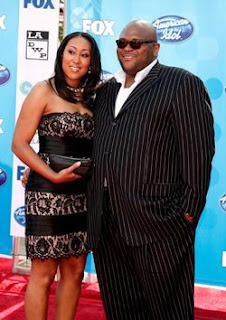 Our faithful readers will recall that last week we reported Season Two American Idol champ Ruben Studdard and his fiance Surata Zuri McCants were seen obtaining a marriage license. 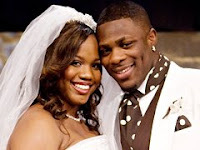 Well, as expected, the two tied the knot on Saturday in Studdard's hometown of Birmingham, Alabama. The groom did not sing at the nuptials. But we're told he was flanked by TWENTY groomsmen. I guess the brother didn't want to leave anybody out. Congratulations to the newlyweds!!!! More details HERE. As her name suggests, Craftgenius is one of our resident experts on beaded jewelry, CD favors, and just about anything wedding related. But she really knows how to work her magic on flowers. She does fabulous centerpieces and bouquets. Today, she tells us about what she's working on for a client's late Summer wedding. This table arrangement mockup was designed for an evening August wedding reception where the guests will dine by candlelight. The colors of the wedding are chocolate, champagne and deep red. The reception venue walls will be completely draped in champagne. Since we discussed the Black-and-White theme this week, we thought it might be nice to wrap things up on a sweet note. 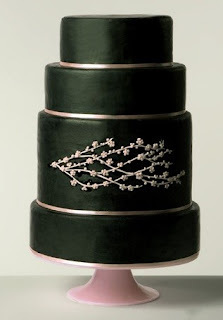 Take a look at this onyx creation made by April Reed Cakes in New York. You may have already heard the news since the nuptials took place a few days ago. But have you seen the pictures of the blessed event? As always, Essence has the goods. Take a look. The folks at SmartMoney.com have been thinking about you. They have an interesting article with tips for brides-to-be called "10 Things The Wedding Industry Won't Tell You". You may already know some of the things on the list. But we want to share these tips with you anyway, because there's bound to be something you might not have thought of. 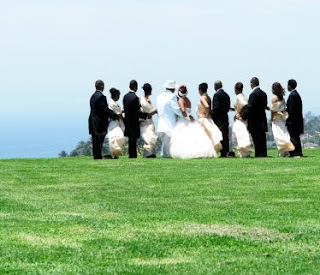 You can also get new ideas from another SmartMoney article- "10 Ways To Cut Wedding Costs". Limit liquor. This one is so obvious it makes our eyes roll. We've been telling people forever to stop going broke on getting people drunk. Stop it! Something borrowed. In keeping with tradition, why not get your "something borrowed" from your local edition of Freecycle.org. Get gorgeous gently-used items for nothing or almost-nothing. Check the website for details. Schedule off-peak. Save big moolah by scheduling off-hours, off-season (usually ends before Mid-April), and off-day. (Remember our article on Friday weddings?) Whatever you do, work it. has GREAT invites, and even they say brides can save an average of $68 dollars just by cutting out the reception card. Plus, if you can whittle your invites down to 2 ounces, (which used to be the norm) you can save another $48 dollars. Have some tips you want to share with us? Tell us all about them in the comments section. 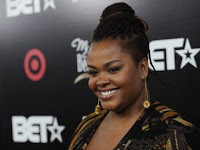 Wedding Bells are also in Jill Scott's future. The sultry singer announced this week she's engaged to her drummer, John Roberts (also known as Lil Jon). Some New York City fans got to hear the news a few days early, though. We're told that toward the end of Jill's JVC Jazz Festival concert at Carnegie Hall last Friday, John presented Jill with a bouquet off roses and gave her a long kiss. That's when she reportedly turned and said to the audience, "Ain't life funny? We're engaged." Woo hoo! 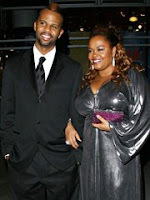 You'll recall Jilly from Philly ended her five-year marriage to Lyzel Williams last year. But we just knew ths gem wouldn't stay on the market for long, didn't we? Here's Jill at the BET Awards this week. The Velvet Teddy Bear will soon be a married man. That's right, ladies. Former American Idol champ Ruben Studdard will wed his longtime girlfriend this weekend. Court records show that he and Surata Zuri McCants took out a marriage license on Monday. The Birmingham, Alabama native was nicknamed the "Velvet Teddy Bear" on Fox's American Idol in 2003. He has released three albums since winning the TV contest and is now working on a new album. His CD "Soulful" went platinum. Black-and-White weddings exude power, drama and elegance. Classic. But how do you pull off this theme without limiting your options? Don't worry. There are several ways to keep it jazzy. You can do this! 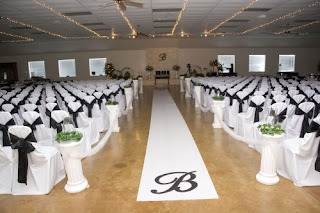 1) First, set the tone with clean, classy invitations in white (or cream or ecru) with black writing. Or flip the script- literally. 2) For your wedding gown, choose a shade of white that complements your skin tone. 3) Deck the groom out in a super-luxe, black and white tux. Add a bit of pop with a monogram! 5) Use splashes of color- in flowers, table decor or other details. 6) If you don't want to add color, add sparkle! Rhinestones, silver, or platinum can be added anywhere you want a little more drama. Better yet, wear your bling on your shoes. 7) Top it all off with candlelight. 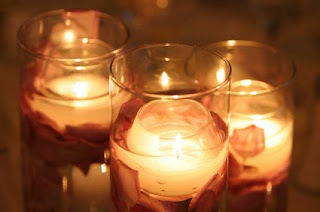 Nothing sets off all your hard work more than the soft glow of lovely, flickering candles. 8) Give favors that share the black-and-white motif. Here's a placecard holder that doubles as a favor box!